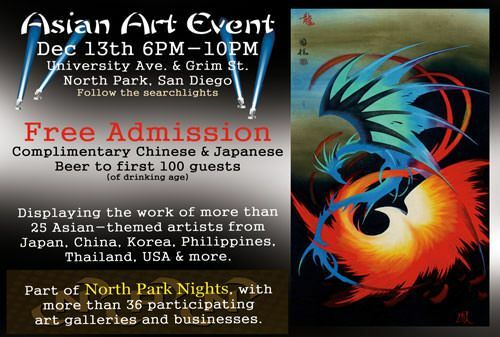 We estimate that some 500 people came to our exhibition at the corner of University Avenue and Grim Avenue in San Diego to see a great array of local and international artists whose creations have various Asian themes. 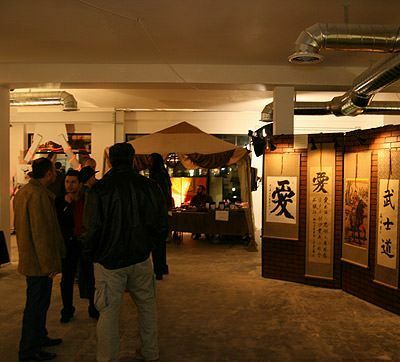 The Whole Leaf Tea House offered an all-night Chinese "Gong Fu" tea ceremony. 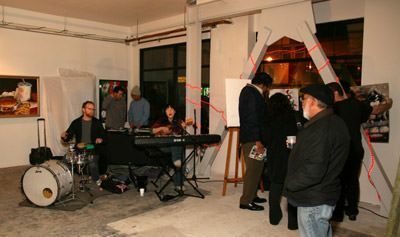 Live bands including Brenda Xu played until 11PM. 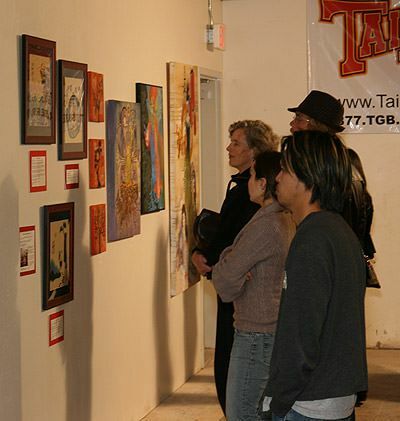 There was even a mix of western artists doing Asian themes and Asian artists doing western themes. 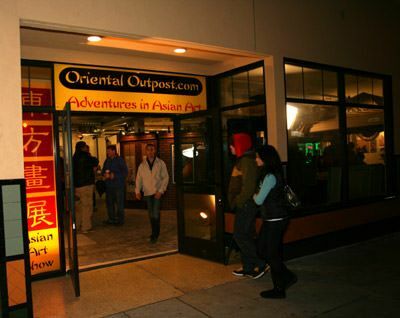 It was a true fusion of various Asian cultures and American culture. 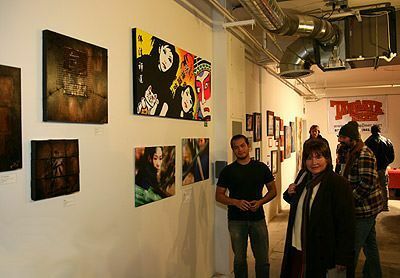 Represented were artists from China, Japan, Korea, America, Indonesia, Turkey, Phillipines, and elsewhere. 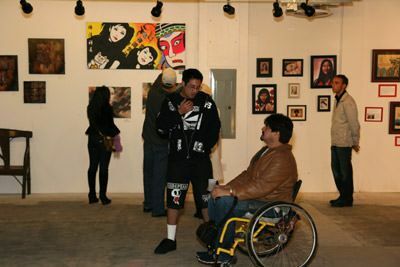 Held at the Groth Building, North Park, San Diego. Front door of the show. 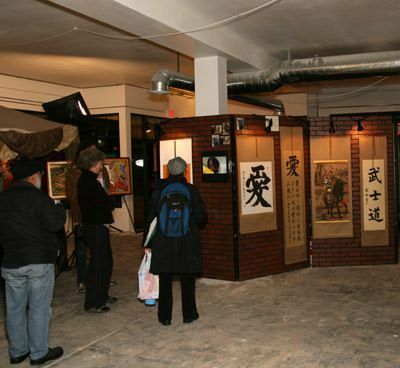 It might be hard to see, but we had a video of the Chinese Master Calligrapher playing, and plenty of works by all of our calligraphers on display. 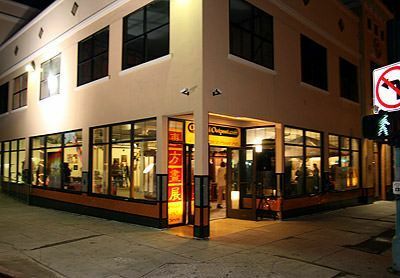 Making up for years past when the show was upstairs with no elevator, we made amends and rented a completely accessible building. 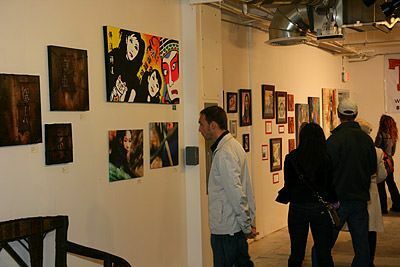 Art patrons check out a wide variety of paintings. Live bands played all night, including Brenda Xu. 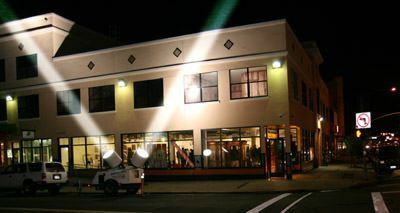 I've wanted to rent searchlights since I was 8 years old. Here was my chance - and I didn't even have to sell used cars!